Server rooms and IT suits are important parts of modern IT systems and require a high level of fire security. Recent advancements in that field enable the gaseous fire suppression of the given space. Except from the total flooding AGC Systems Ltd. offers also the fire suppression solutions for the rack cabinets. In the instances where the total flooding of the space is either physically impossible or uneconomic, the local fire suppression is the only solution. This task in managed by the particular panel placed in the upper part of the 19-inch rack (or other rack cabinet compatible with this kind of the device). AGC Master Extinguishing System (fig. 1.) is a compact device composed of two subsystems: fire detection and fire control subsystem, and fire suppression subsystem. Fire detection and fire control center, and optical smoke detectors comprise the fire detection and fire control subsystem. The fire suppression system includes a cylinder filled with HFC236fa (FE-36) gaseous extinguishing agent released by the electric actuator; pressure drop indicator and manometer. AGC Master Extinguishing Apparatus is used for the fire suppression in a standard 19-inch rack. 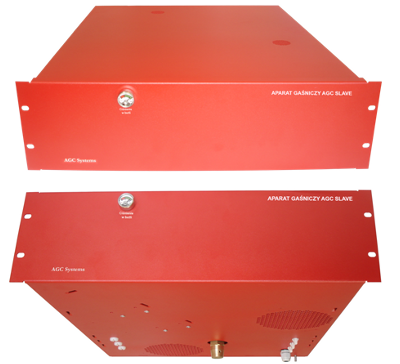 AGC Master Extinguishing Apparatus and AGC Slave Extinguishing Apparatus are connected to each other when applied in the set of two 19-inch racks joined side by side, creating a common cubic volume (fig.2.). 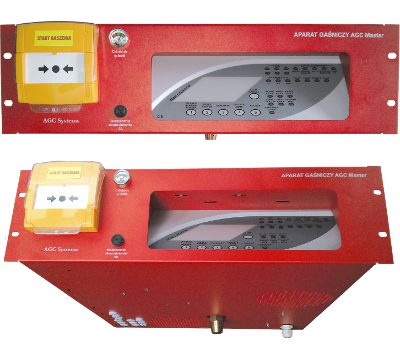 AGC Slave Extinguishing Apparatus is activated when paired with AGC Master Extinguishing Apparatus. Slave is also complimented by optical indicators and a cylinder filled with FE-36 gaseous extinguishing agent. The device is shaped into a 19-inch width, 3U height panel designed to be placed on the top shelf of the cabinet. The extinguishing apparatus due to its sensitivity is able to launch the fire suppressing procedure 10 seconds after the fire is detected. The device is fully independent. Also the assembly and initializing of the extinguishing panel are simple procedures. AGC Master and AGC Slave Extinguishing Apparatuses are fitted with cylinders filled with HFC 236fa gaseous extinguishing agent able to suppress fire in a 3m3 leak proof cabinet. In the case the racks are joined side by side in a set, additional Slave panels can be used to increase the amount of gas needed to suppress fire in a bigger cubic volume.